The themes of play ranges from day-to-day lives to Vietnamese folk tales and legends. Stories of the harvest, of fishing and of festivals are often highlighted. Modern performances usually consist of several short sketches rather than one long story, taking the audience on a journey of ancient village life, agricultural harvests and dances of mythical creatures. The puppets are made of wood and then lacquered to make it watertight and endurable. Each puppet stands about two feet tall and can weigh between 9 and 14 kg. Maneuvering them across the stage while synchronizing the movement of their limbs require strength, dexterity and sometimes two or three people. The puppet is usually fixed to a floating base at one end of a long bamboo. The base includes a rudder and acts as a fulcrum for the strings that control the upper body. The details of their tricks have been kept secret for centuries. Even today, village guilds of puppeteers refer to the more complex maneuvers only by code names. Generation of puppeteers have suffered from water-borne diseases, rheumatism and leeches while practicing the craft. Early puppeteers downed strong doses of nuoc mam (a fish sauce) and ginger tea to help them endure bitingly cold winter performances. Modern puppeteers now wear protective clothing. 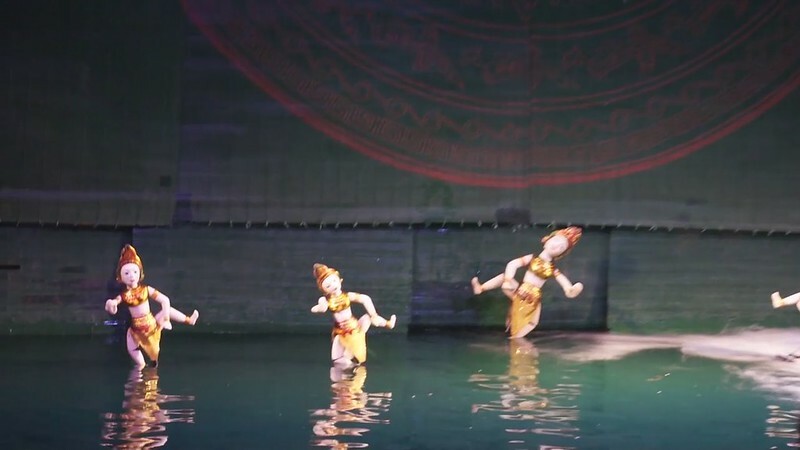 The Thang Long Water Puppet Theater in Hanoi is famous for these shows. Founded in 1969, the theater has since performed throughout the world.